Through the grubby window plastered with tiny foreign bugs, I can distinguish the turquoise water of Mission Beach curving onto the blond sand, the lush spans of emerald rainforest, and the Great Barrier Reef. Just when the fraudulent wave of vacation calm washes over me, the plane door swooshes wide open and I warily slide my feet over the edge until my black suede Puma sneakers rock turbulently over the blurry stretch of clouds. Mike squeezes my clear plastic goggles on so tightly that they cut into my ruddy cheeks. “Ya’ ready, mate?” he asks slapping my hand, which I think is meant to be a high-five. “One…two…three!” We plunge out of the plane face first, freefalling for a full 60 seconds at approximately 120 miles per hour through the normally distant haze of the Queensland sky. 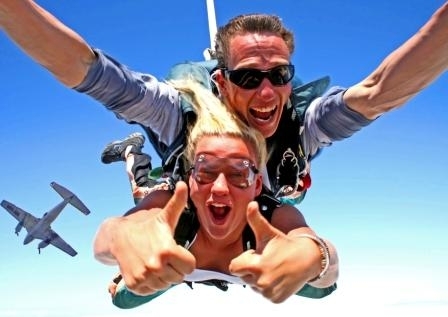 First-time jumpers are only allowed to jump tandem, harnessed to a certified skydiver. Most skydiving facilities require a 15 to 45 minute, simple, on-the-ground safety demonstration, Skydive Cairns teaches the standard jumping formula: when you initially exit the plane, you cross your arms into an ‘X’ and tilt your head backwards; once outside the aircraft, you stretch your arms straight out in front of you and let your legs extend upwards. “They called it the ‘banana bend’ which was hilarious, but it actually helped me remember what to do once we got up there,” Jacoby laughs. “Also try stretching your arms and legs back as far as you can. It’s a little secret to going a little bit faster during your freefall.” The final step of the jump is lifting up your legs when landing so your bottom hits the ground, rather than your feet. My rush of freefall is relieved only with the swift opening of my voluminous rainbow-colored parachute that the instructor deploys at approximately 4,500 feet. All I see are two coarse baseball mitts hands form two shaka signs in front of my face as the clouds disintegrate around my body. “Good on ya’! That was ripper!” Mike says. American English translation: “Well done, buddy! That was fantastic!” And I couldn’t agree more. Skydive Cairns has brilliant views over Cairns, the World Heritage Rainforest, and the Great Barrier Reef. This site offers tandem skydiving from 9,000 to 14,000 feet, priced from $249 to $334 including Australian Parachute Federation levy. Digital photo and DVD packages are also available for an additional $99 and up. Sessions are 7:30 a.m., 9:00 a.m., 12:30 p.m., and 2:00 p.m. daily. Skydiving takes approximately a half a day; be sure to wear comfortable clothing and sneakers. Try to eat and drink lightly before your jump. The minimum age to skydive is 14 years old; the maximum weight of a jumper is approximately 250 pounds. Jumpers also should not go scuba diving 48 hours before skydiving to avoid decompression sickness, so plan your itinerary accordingly. All tandem skydiving packages include transfers to and from your accommodation, individualized training and instruction, parachutes equipped with a backup automatic parachute deployment computer, Cairns largest drop zone for safer landings, the option to fly your own parachute, and a personalized photo skydiving certificate. Skydive Cairns is located at 82 Grafton Street in the heart of Cairns; Queensland, Australia. The closet airport is Cairns Airport located on Airport Avenue, Cairns, QLD 4870. Local phone: +61 7 4031 5466. International phone: 1 800 444 568 or visit http://www.skydivecairns.com.au/ to book online.